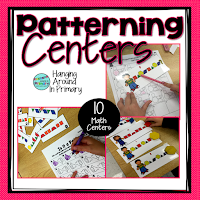 Use Patterning Centers that Teach the Curriculum and Ditch the Worksheets! I love, love, love using hands-on centers during my guided math time. What I don't love is marking the worksheet follow up pages that often accompany centers. The more I reflect on my practice, the more I am coming to realize that I can use centers, like the patterning centers I am sharing in this post and there does not need to be a worksheet to keep kids accountable. Math Centers and math activities are a huge part of my math instruction. Students need kinesthetic experiences as much as possible, especially in first grade, where I have spent most of my career. My first math unit is always Patterning. That is the one area of math that students all seem to come to first grade with an ability to do. 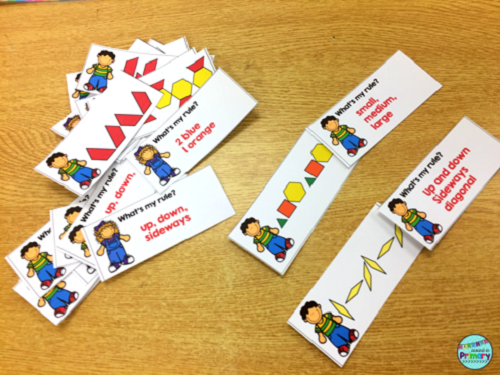 They can easily recognize and create patterns, so it sets them up for success in math right from the start and helps them approach math with a growth mindset. 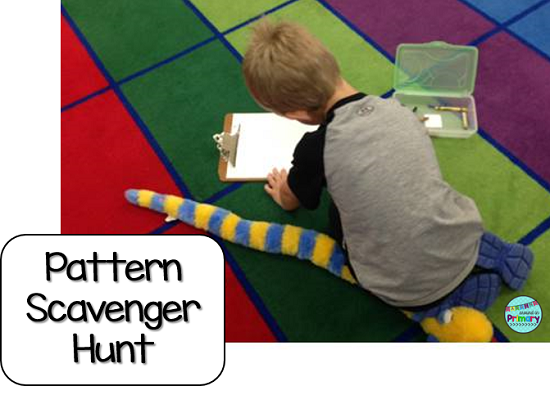 Patterns are everywhere, and a pattern scavenger hunt is a perfect spot to start! Put out the clipboards and send them hunting for patterns to record and you will be amazed at what they draw and write. 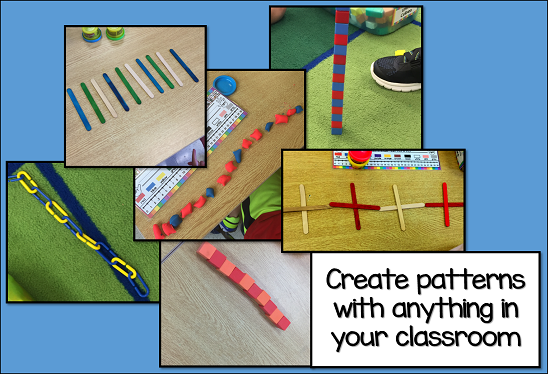 Putting out any and all of your math manipulatives and loose parts is also a great way to inspire kids to pattern. As teachers, we want to document their work as proof of learning. Having students draw to show their work is one way to do it or giving them a worksheet is another. Lately, though, I have embraced technology and now have my students show their learning very frequently by taking a picture on our class I-pads. They love to use the I-pads, so they are motivated to complete their tasks, so they can take a picture and share their work with me. All of those pictures need a home, and I found the app that makes this process super simple. When I am ready to target particular expectations I somewhat move away from using any manipulatives and use more directed centers aimed at addressing particular expectations. My favourite go-to manipulatives have to be pattern blocks when it comes to patterning. Clip cards are a huge hit in my class. They love the colourful clothespins. 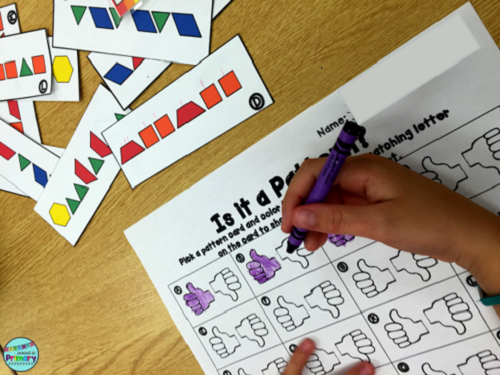 These cards challenge students to name the pattern, and another option asks students to extend the pattern, both first-grade expectations you can address with this one activity. The ability to look closely at a pattern and discriminate between patterns and non-patterns is an important skill to develop. You can use these cards as a sorting center - worksheet free - or many students can use the same cards and colour their responses in. 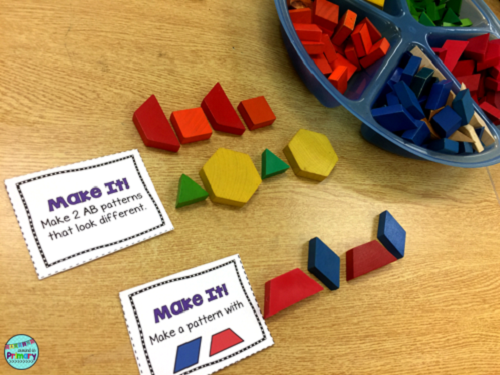 This is a more open-ended activity that provides criteria for pattern creation but allows students to create with the blocks of their choosing. 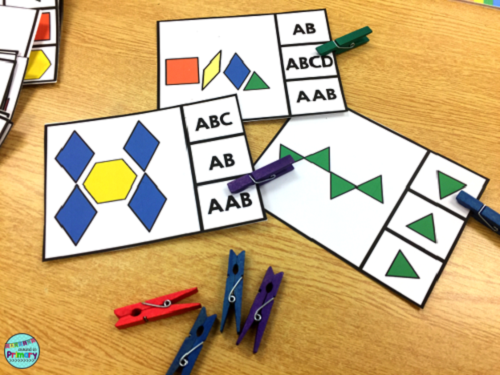 It is differentiated in that your students can create a simple pattern as was created for the bottom card or they can create a more complex pattern using the same blocks for the same Make It! Task card. Post-its are another great tool for quick and simple check in's. Rather than using a worksheet use a post-it and have student's record their answer on it. You can do a simple checkmark on the post-it to show you have seen it and they understood the concept or take a picture of the post-it and the center. Recognizing pattern rules and expressing a pattern regarding the rule is more challenging for my students. This is a great activity to purposefully pair stronger readers with weaker ones to create a more successful center time while sorting patterns with pattern rules. 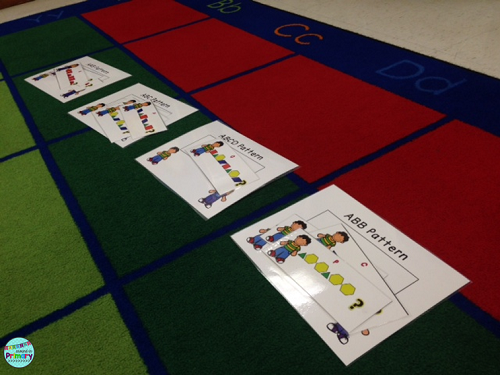 Sorting out patterns by names helps students to realize that any pattern can be represented in a multitude of ways. They are always amazed as they sort that there are several cards on each of the pattern names. They have an idea that there is only one correct answer and thus only one way to make each pattern. It helps to solidify the idea that there is not one right answer. You can check out these centers by clicking on any of the above images or by clicking on the image below. While there is some problem solving evident using these centers, it is not the focus. Instead, we work through pattern block problem-solving challenges. I do have students complete these activity sheets, but you could also project them on your interactive whiteboard and have students solve the problem with pattern blocks at their desk and take pictures of their solutions. I am not advocating doing away with paper pencil tasks completely but I am advocating finding new ways to document learning. One added bonus I am finding during center time is students returning to centers they have already worked at. This has not been the case in the past when they completed the center and accompanying worksheet. I think once they completed the paper, in their mind they were "done" and saw no reason to return and work there again. 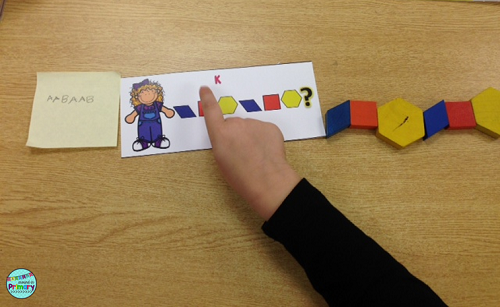 I hope you have found a bit of inspiration here for your own Kindergarten or Grade 1 patterning unit. 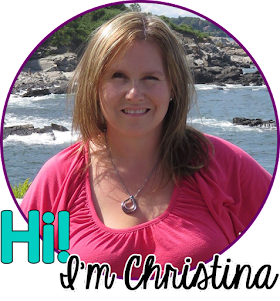 It is a great math unit to break away from traditional methods and let the kids surprise you. 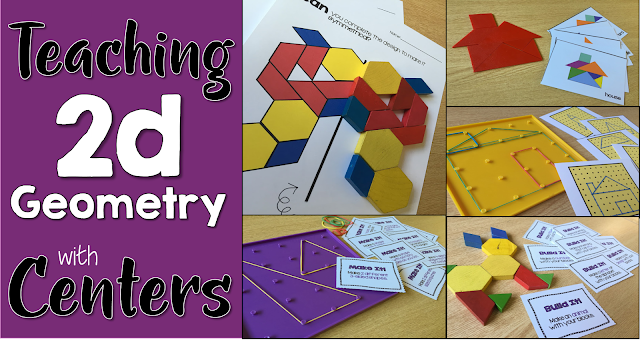 If you are looking for more math center ideas then check out this post for 2D geometry.